There is a new blog helping spread the word from Argentina, Celtico, who has been quite active on Twitter. I look forward to reading more by him and welcome him to spreading the gospel of Celtic Rock and Punk. His page is at http://www.celtico.com.ar/en/ and has a great review of Sir Regs new album 21st Century Loser. Enjoy! When I listen to music I am going to review, for several days, that is all that gets played – in doing so, I subject a co-worker to the music as I don’t use headphones. Typically she bears with it and even knows some of the songs as her husband is a fan of the traditionals. This past week, she even had some favorable things to say about The Langer’s Ball. 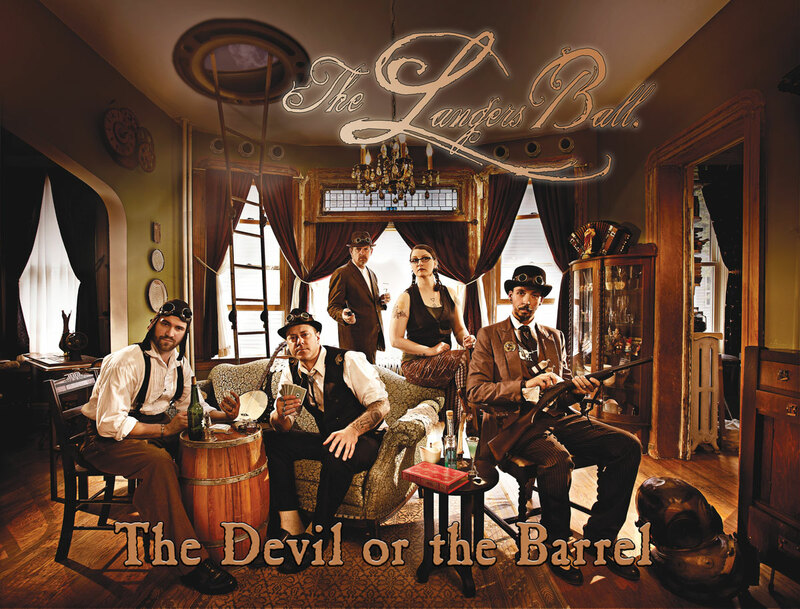 The Devil or the Barrel is the newest release to come from The Langer’s Ball. This upper Midwest band deftly combines traditional styling with a rocking attitude bringing forth a wonderful unique album which one would be surprised to hear given how many covers it has. The key to the success of The Devil or the Barrel is how Langer’s Ball has changed the tempos and overall tones of the songs. A great example of this for me is All For Me Grog, a typically fast paced song, has been slowed (but not mellowed) making it more of a solemn song that instead of being the typical drinking song, brings one to contemplate the lengths one will go for the drink. Their version has quickly become my favorite! Some other notable cover versions are Rye Whiskey maintaining the American Folk styling but it is still beefed up to keep it rocking. I would have to say that one of my favorite songs on the album is The Little Vagabond, based on the William Blake poem. Not all is perfect, as Fields of Athenry left me flat- don’t get me wrong – it is very competent but perhaps as one of the most covered songs, it would really take something amazing to have that song stand out. There are four original songs on the album; Whiskey Chaser, Kick Around, One More and Mackey’s Daughter. The original songs are the true stars of the album! The songs have the clear Celtic influence while bringing something brand new to enjoy. I really look forward to hearing more original pieces from Langer’s Ball. Finely crafted musically but the lyrics are truly stellar! Overall, The Devil or the Barrel is a lovely piece of work and I would highly recommend it to anyone! Lexington Field from San Diego is on tour this month and St Louis is lucky enough to be a stop for them, they are playing on Wednesday, August 8th. I was lucky enough that today is their off day between Kansas City and St Louis. Tonight I hung out with the band, plus Chad from Rusty Nail. If I can describe the evening in three words, it would be insanity fueled fun! Granted, the band will blame it being on day 6 of their tour, but I think it only accentuated their insanity. The evening started with meeting them at their hotel room, then going to look for BBQ, but unfortunately it was closed. 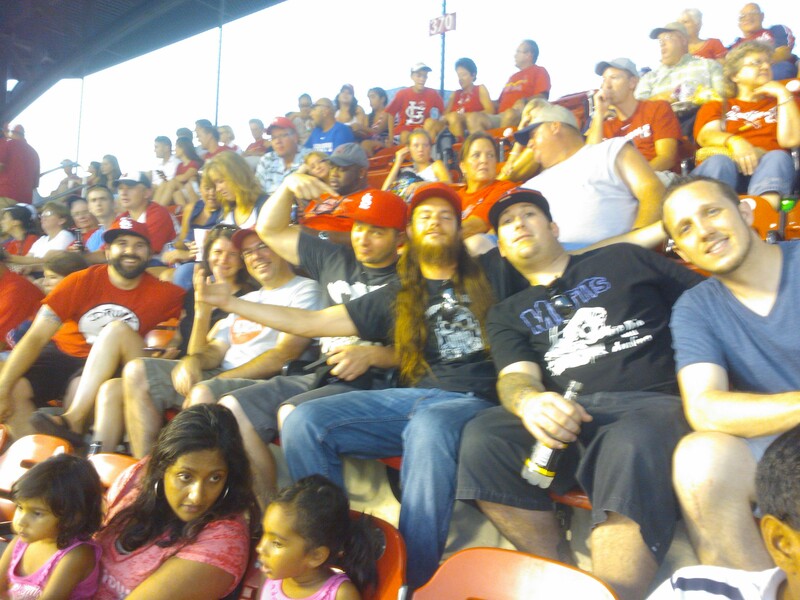 Instead we head to a local Irish/Welsh pub, had dinner and caught the trolley to the ballpark to catch the Cards play the Giants. As the band members are Padres fans, they were more than happy to root for the Cardinals, but sadly the Cards did not pull out the win. After the game, we caught a group doing percussion with a 6 year old drummer that has a great musical future then headed back to the pub for the band to get additional drinks. Without going into details (bear with me, it is late and I do have to get some sleep!) the evening was a lot of fun and I have yet to see the band even play yet! Stay tuned for more as I will be writing about the actual concert with Lexington Field and locals Rusty Nail! JULY 16, 2012 LEXINGTON FIELD SET TO EMBARK ON FIRST NATIONAL TOUR SAN DIEGO – The American Fiddle Rock band Lexington Field, out of San Diego, CA, announced today they will be going on their first national tour August 2 through 25, 2012. 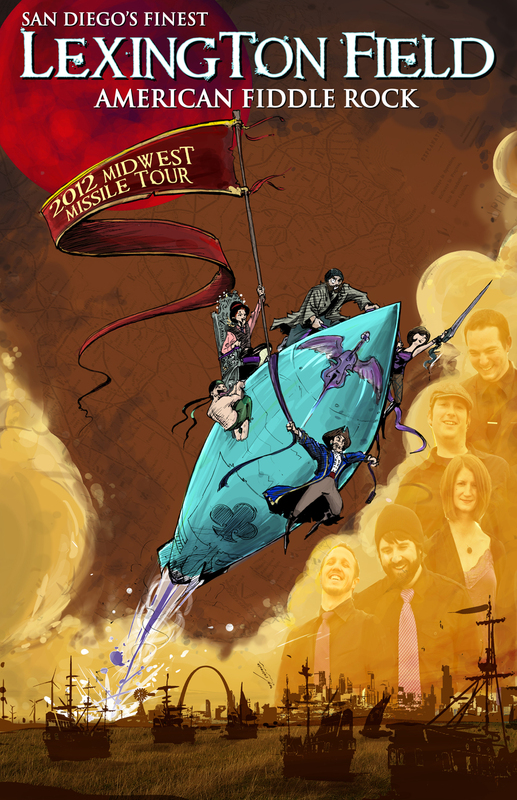 The name of the tour is titled the “2012 Midwest Missile Tour” since most of the dates will take place in the Midwest part of the country. After a successful Kickstarter Project in June to help fund the rest of the costs, Lexington Field is now ready to go. They will be playing 22 shows across 20 American cities, including debut stops in Chicago, Denver, St. Louis, Minneapolis, Seattle, and San Francisco. Lexington Field will also share the stage with some great Celtic Rock bands such as The Fisticuffs, Screw City Saints, The Langer’s Ball, Hounds of Finn, Wild Colonial Bhoys, Rusty Nail, and many more talented bands across different genres. As you all know I am going through trying times. I started feeling like I was going though this alone, but from the outpouring of tweets, Facebook messages, email and physical support from my friends I see I am not alone. I want everyone to know I appreciate all the kind words, encouragement and hugs they have given me. It has been an eye opening experience for me, letting me see that I have more friends than I thought. I see even in this dark time I am blessed. Appreciate those around you and don’t take their friendship and love for granted!